With more than 500,000 people killed and at least half the population displaced, Syria’s conflict is the most deadly of the twenty-first century. Russia’s decision to join the war has broken the long military and political stalemate but it looks unlikely to deliver any of the core demands that spawned the original uprising against the Ba’athist regime. In this fully revised second edition of his acclaimed text, Samer Abboud provides an in-depth analysis of Syria’s descent into civil war, the subsequent stalemate, and the consequences of Russian military involvement after 2015. He unravels the complex and multi-layered drivers of the conflict and demonstrates how rebel fragmentation, sustained regime violence, international actors, and the emergence of competing centers of power tore Syria apart in wholly irreversible ways. A resolution to the Syrian catastrophe seems to have emerged in the aftermath of Russia’s intervention, but, as Abboud argues, this “authoritarian peace” contains the seeds of continued and future conflict in Syria. While the Assad regime has so far survived, the instability, violence, and insecurity that continue to shape everyday life for the Syrian people portend an uncertain future that will have repercussions on the wider Middle East for years to come. Samer N. Abboud is Associate Professor of Global Interdisciplinary Studies at Villanova University. -a comparative perspective on democratic transitions and regime breakdowns, showing why some of the uprisings turned violent, including Syria, while others did not, like Tunisia, Egypt and Jordan. 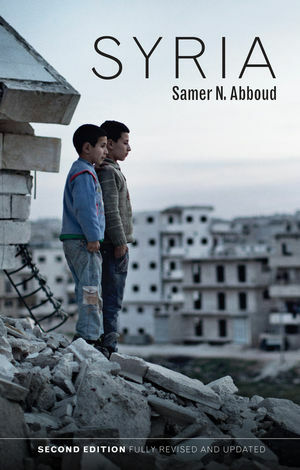 "Samer Abboud’s Syria is an indispensable reference on the uprising and brutal conflict that has raged in Syria since 2011. Abboud is masterful in providing an account that is at once accessible, balanced and analytically sophisticated. He explains clearly how a wartime order took hold in Syria after 2011, who its key actors are, their roles in the conflict,and how the likely imposition of an ‘authoritarian peace’ under the Assad regime is unlikely to deliver either stability or security to a country ravaged by violence."